NEW: See for information about our newest service. We'd like to be YOUR print and mailing services provider. Our shop has capability that defies our size; from short-run color laser copies, one and two sided, to full 28" x 40" press sheets, we can do it all. Prepress includes both Mac and PC platforms with the latest Adobe Creative Suite software. Archives of customers' files goes back to the mid-90s. Our platemaking is environmently-friendly, with no chemicals used at all in processing. Presses range from 1 color small format to 5 color. Bindery includes 2 full-size folders, a 6 station Muller-Martini collator-stitcher-trimmer with continuous stacker, a Lawson 5 spindle drill and a 36" Polar programmable cutter. Mailing services include label and inkjet, with our exclusive QR+ program to enable your mailings to be interactive. 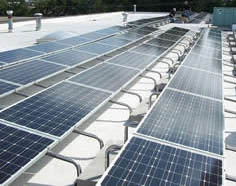 We are enrolled with DTE's Solar Currents program, and our plant roof has approximately 4,000 square feet of solar panels. Located in the Metro West Industrial Park, near the intersection of Five Mile and Sheldon Roads.